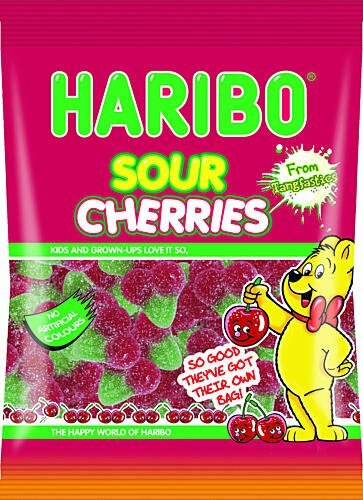 Haribo Candy Online- All About Haribo Candy, and Where to Buy It! 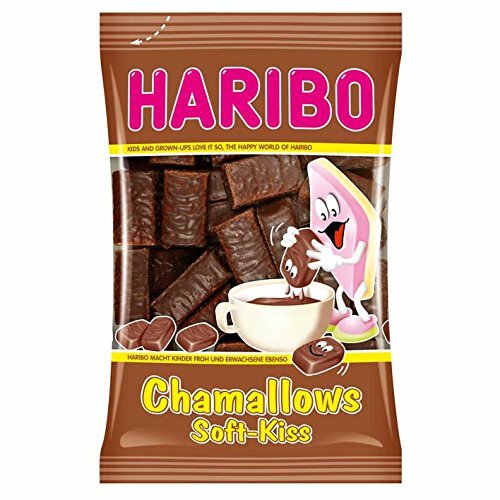 Home German Foods and Recipes German Candy Haribo Candy Online- All About Haribo Candy, and Where to Buy It! 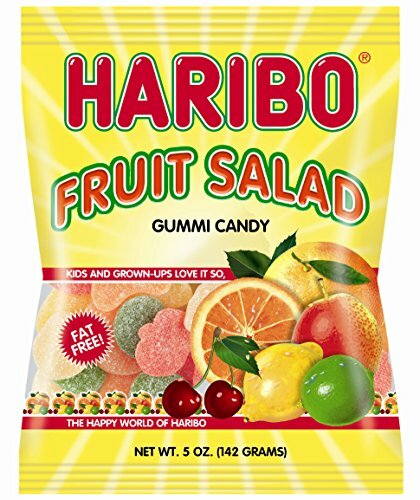 The other day a friend of mine mentioned that she had gone to 4 different stores searching for her favorite flavor of Haribo candy. WHY? 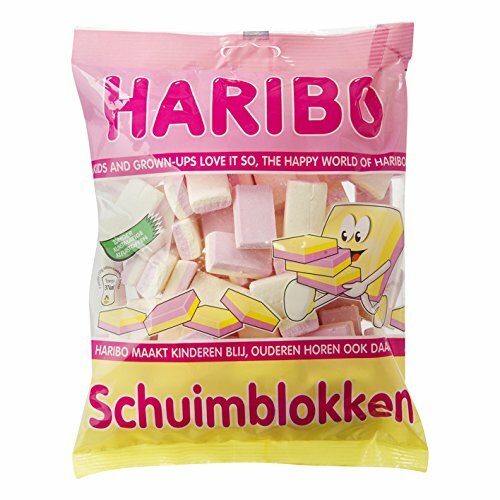 You can easily get Haribo Candy Online! There are loads of flavors, including her favorites, available…. 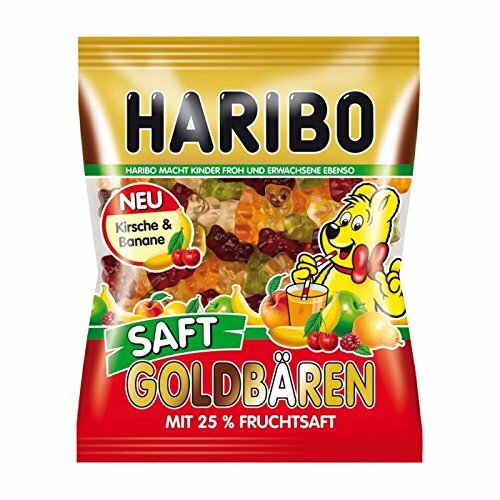 and, better yet… You can even get the REAL GERMAN Haribo, not just the American versions. YUM!! 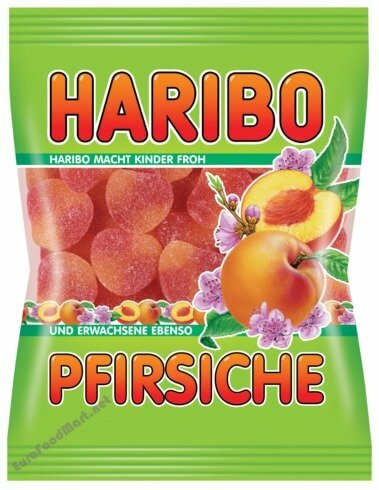 In 1920, Hans Riegel (of the Riegel Chocolate Family) broke off and started his own company… Haribo (another German name formed by combining letters from one big name… Hans Riegel, Bonn.) 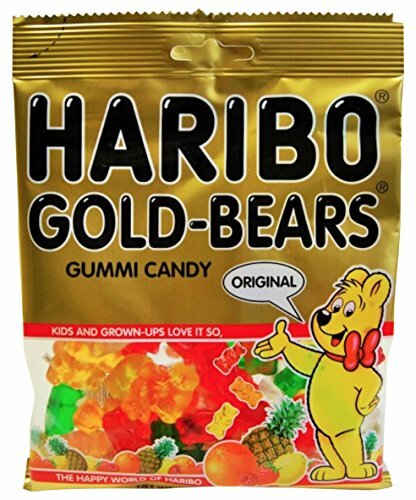 According to the Haribo website, the company was born out of ” a sack of sugar, a marble slab, a stool, a walled-up stove, a copper kettle, and a roller.” By 1922, the first little “Dancing Bear” was made from fruit gum. 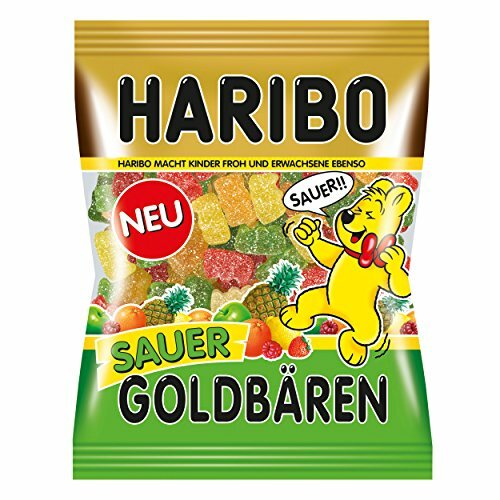 This Haribo Gold Bear launched millions of other gummi bears! 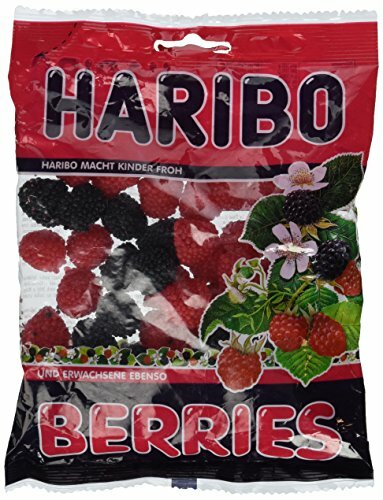 Today, the company operates in 15 factories world wide producing hundreds of millions of gummi bears, and other gummi shapes, as well as licorice and other treats. 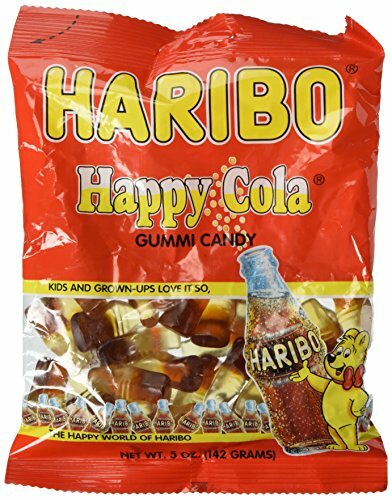 Many AMERICAN Haribo candies are made with GLUCOSE (from wheat or corn). 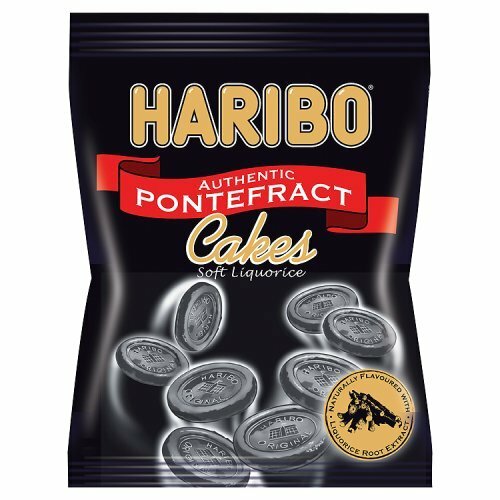 Some Haribo varieties like, Twin Cherries, Peaches, Happy Cola and Snakes don’t have this ingredient. If you are sensitive to glucose, check the label. 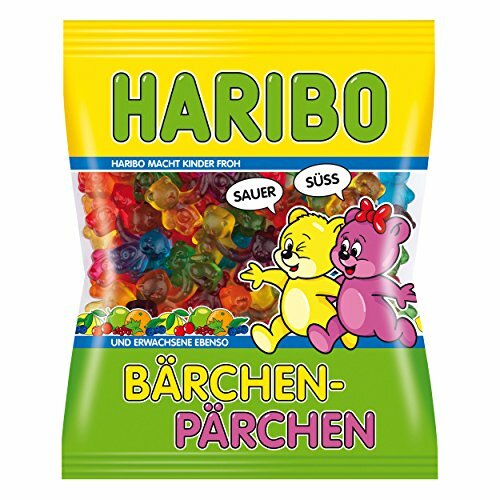 Haribo products are not kosher. 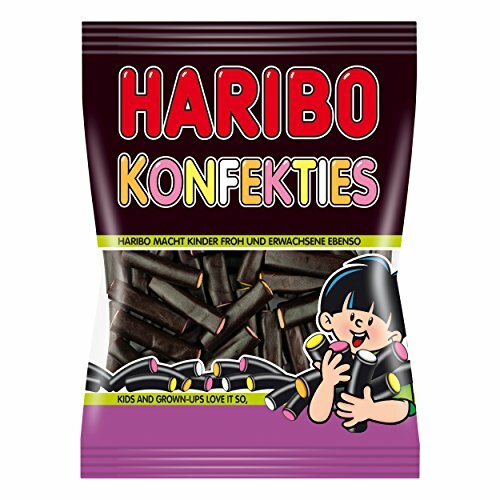 There is however, a kosher line of Haribo sold exclusively through Paskesz. 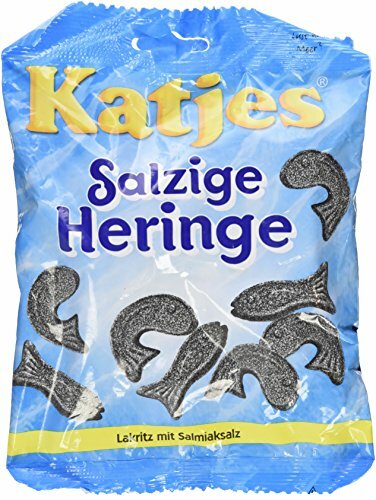 The Kosher products are made with fish gelatin and are clearly marked. 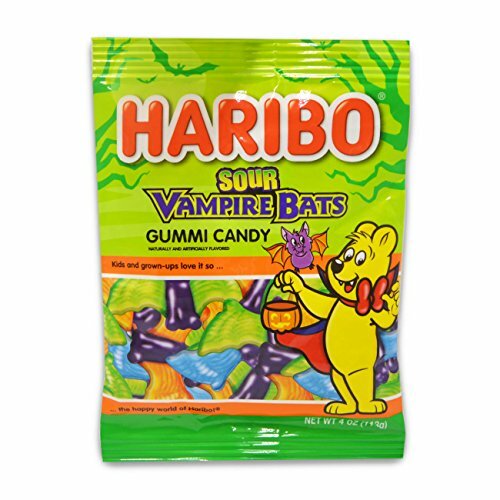 Haribo gummy candy is made with animal derived gelatin, often mostly pork gelatin. 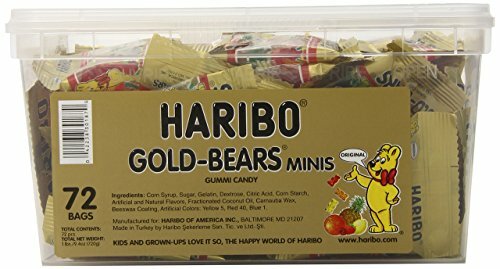 In Turkey, there is a factory that makes Gummi Bears from bovine gelatin (cows) so they are Halal. These packages will be marked. 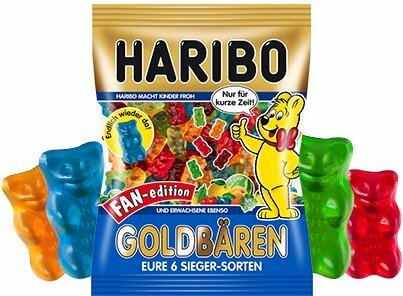 What is the difference Between German and American Haribo Bears? 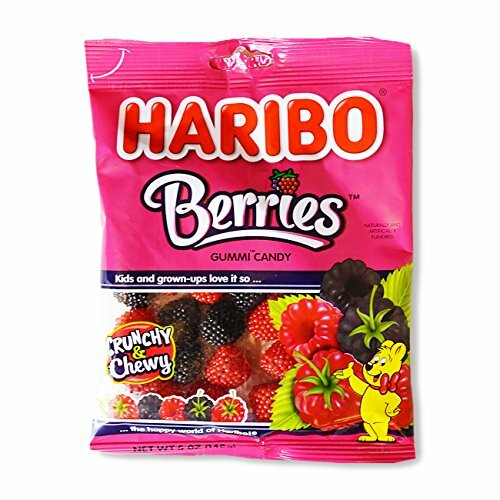 The primary difference between German and American Haribo bears is the ingredients… In Germany, Corn Syrup and Artificial flavorings are not allowed, so the colors and flavors are more subtle. Also, the German Bears are more chewy than their softer American cousins. 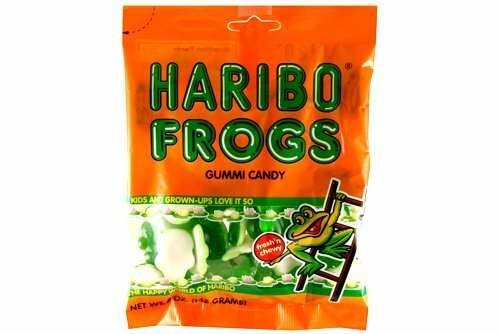 Also, in Germany, the strawberry flavored Gummi Bear is pink, while in America, it’s green. 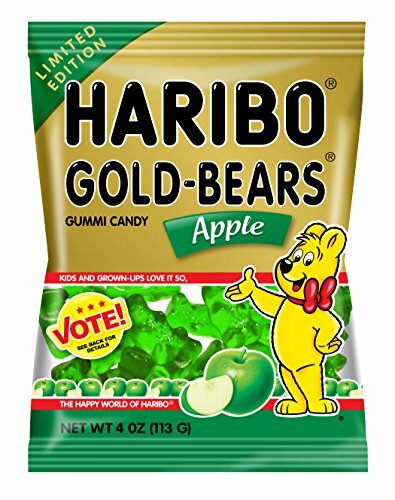 This is a bit confusing… but be aware that the green bear in Germany is apple flavored, and apple doesn’t come in the American Bear mix…. 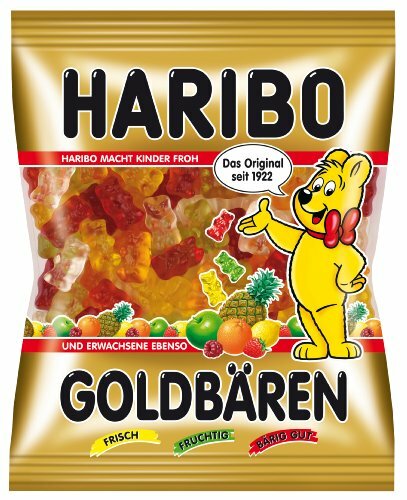 The original Haribo Golden Bears from Germany including apple flavor. Get a bag… or buy a TUB of mini-packets (perfect to keep in your purse, briefcase, pocket or glove compartment for Gummi Bear emergencies. 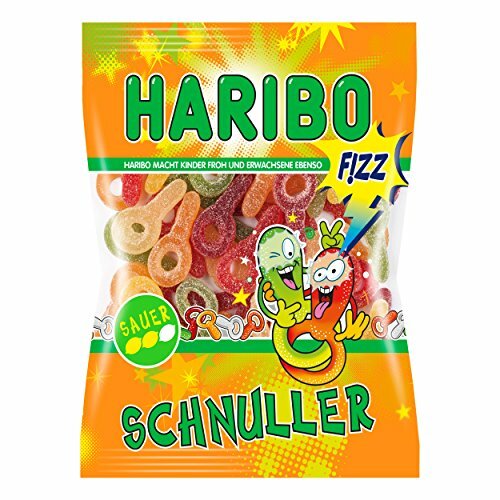 Juicy, Sour and the special limited Fan-Edition with new flavors chosen by super Haribo fans! 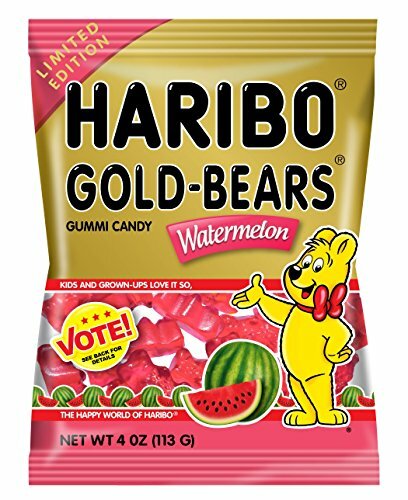 The American Haribo Golden Bear Cousin… with slightly different flavors, and much stronger colors. These tend to be much less expensive than the imports. Special Flavors and special Single Flavor Bags are NOW AVAILABLE! 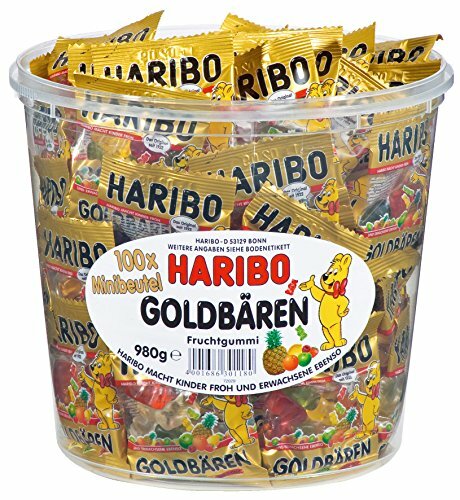 Need a LOT of Haribo Bears? 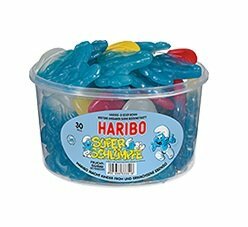 Buy a 5 Pound TUB of Haribo Gummi Bears from the online Candy Store. 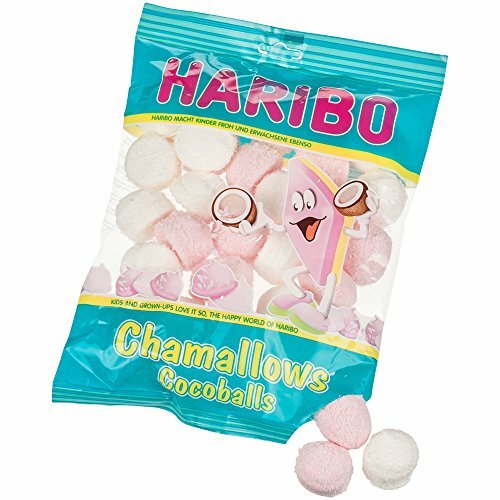 Haribo is more than just Bears… there are fruits, snakes, cola bottles and more! 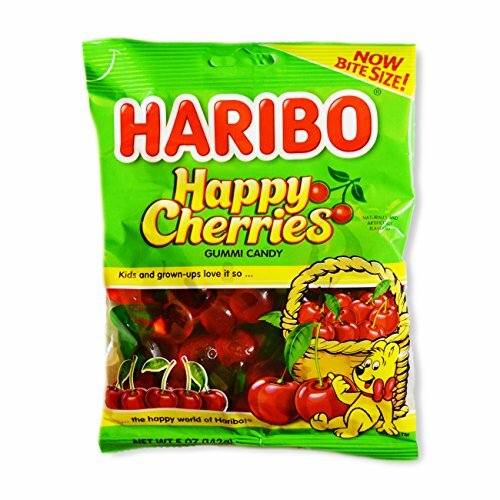 Take a look at all of the different varieties and flavors of Haribo Candy Online (in no particular order)! Then start enjoying! Twin red globes of cherry flavored gummy joined by green stems. When we were kids we would slip them over our fingers as rings (or even over the ear as an earring…). Pull the cherries apart, or eat them in one bite! 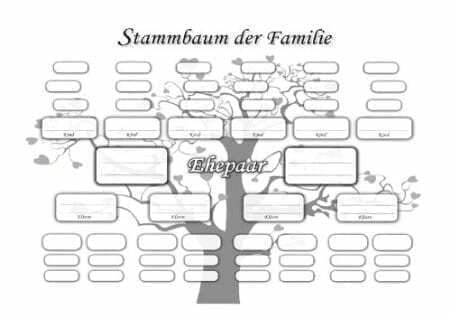 German and American types are available. 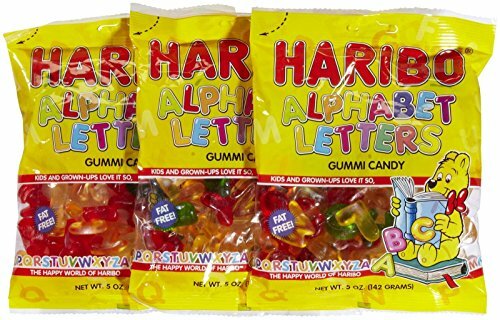 Basically, the letters are the same flavors as the Gummi Bears. The difference? Like a bowl of Alphabet soup, you get to spell with your food. 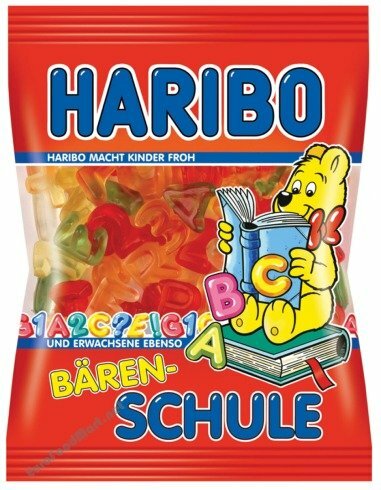 The German version contains letters AND numbers, and is called Bären Schule… Bear School. 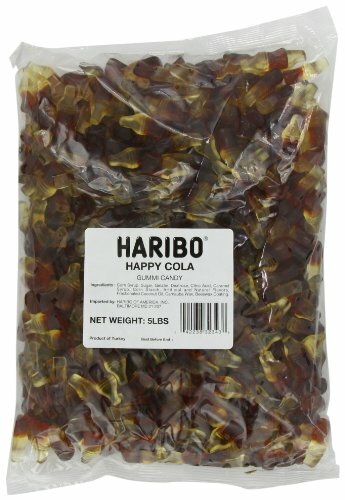 Whether you want your Cola Gummy Happy (smooth and sweet) or fizzy (with a bit of tang) there’s a cola gummy for you. I love the little bottle shapes! We would always pretend we were drinking them…. They come in 5 oz. bags, tubs of 60 giant bottles or 5 pounds bags! 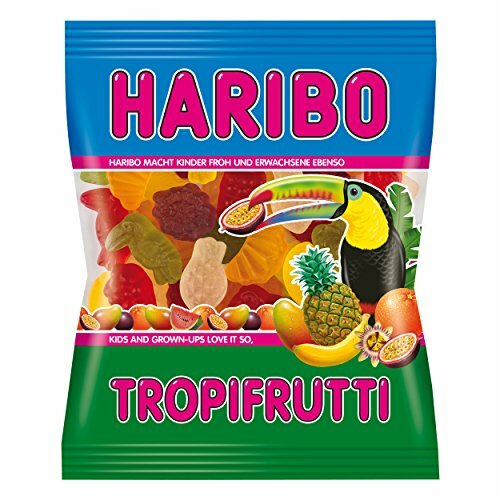 A nice mix of different Haribo Gummi Flavors in fruit shapes. I love the extra sugar crunch on the outside of the fruit salad. In my house, everyone picks out the peach, so I end up with all the rest of the flavors. On the other hand, everyone loves all flavors of the Tropifrutti! 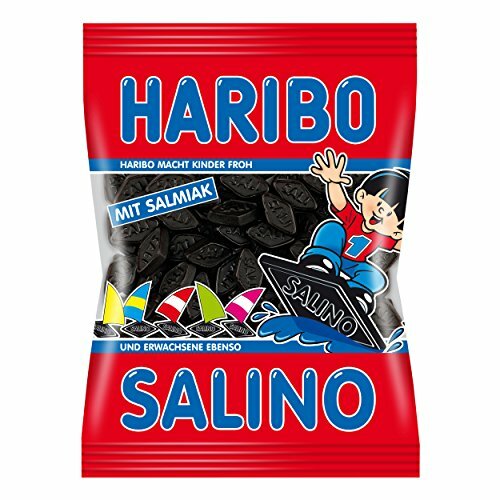 Despite both candies having Wine or Wein in the name, Wine Gums are very different from Weinland Gummies. 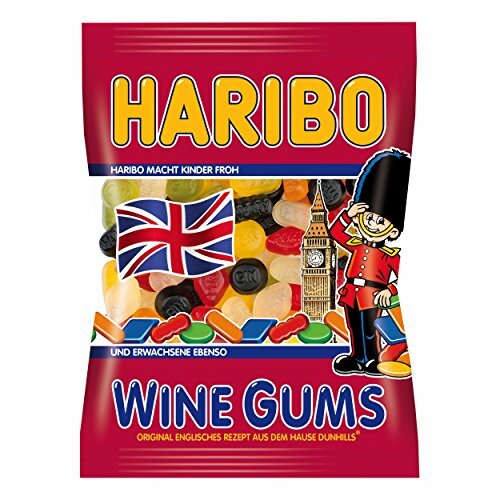 Wine gums are a typical English chewy gummy with flavors like blackcurrant, pineapple, lemon, lime, orange and raspberry juice. 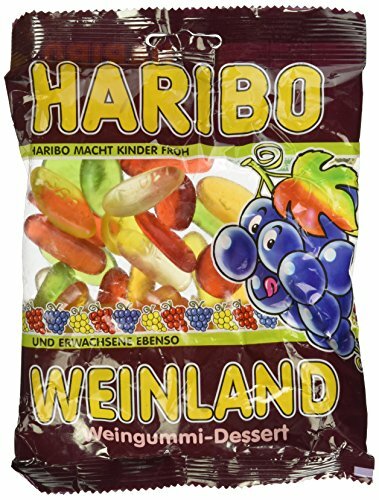 Weinland Gummis are made with wine (it’s sadly cooked out during the manufacturing process). The gummis are also shaped differently. Try both and see what you like best! 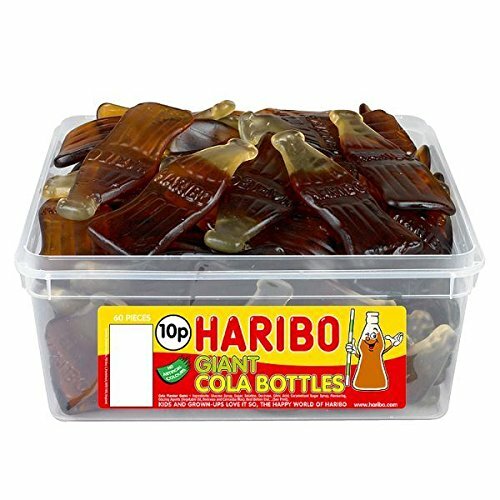 Haribo Wine Gums 200g Haribo Weinland Gummi Candy / 200g / 7.1oz. How creative is this? 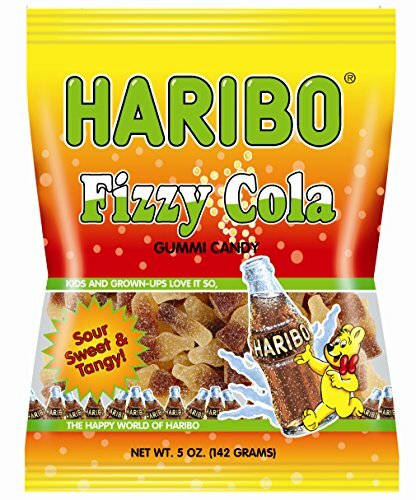 Haribo came up with the idea of having a 2 flavored soft filling surrounded by a gummi coating. And then they packaged it 3 different ways, so you can choose how you want to snack! 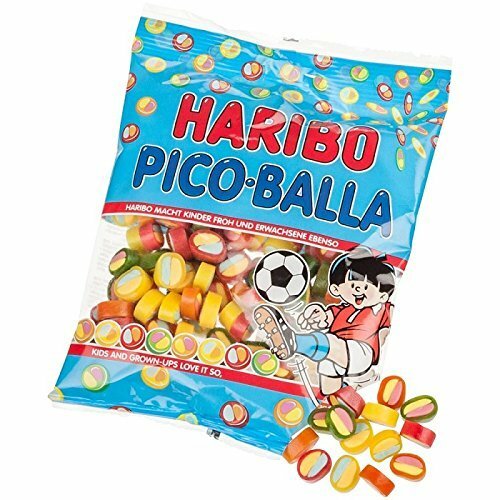 Pico Balla are little bits, perfect for stuffing into your mouth by the handful. 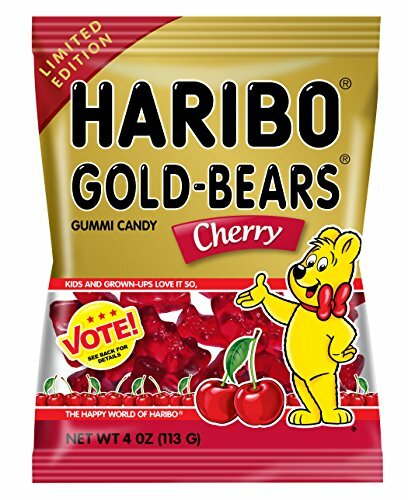 The texture isn’t as gummi as the bears… and it does take some getting used to. Balla-Balla are longer drops of the same stuff. 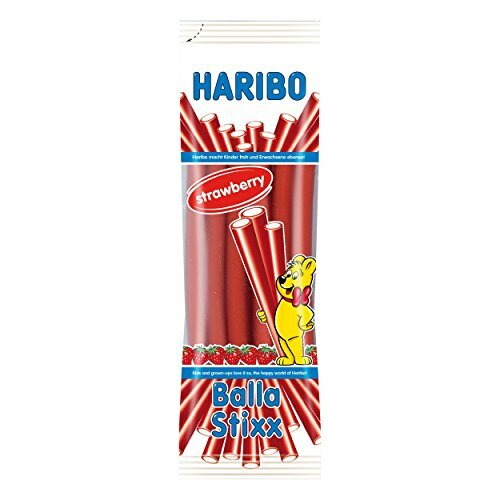 And finally, Balla Stixx are the longest version of all… Fruity and gummy on the outside, fruity and soft on the inside… all the Balla are fairly addictive. Sweet or Sour…Can’t decide? 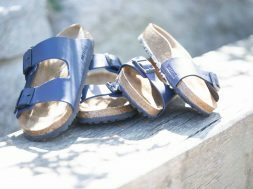 The Barchen Parchen is the Haibo for you. The Bear Pairs one sweet and one sour hold hands, so you get both in one bite! Don’t want to eat bears? 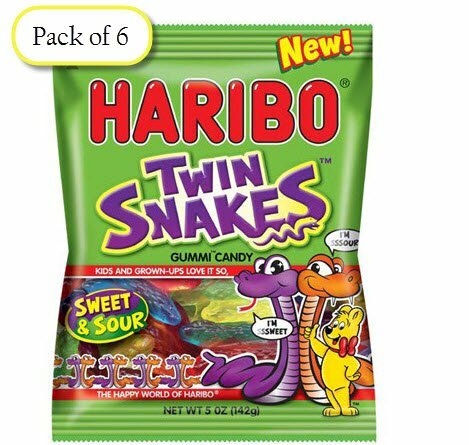 You can get the same sweet/sour combination with Haribo Twin Snakes. 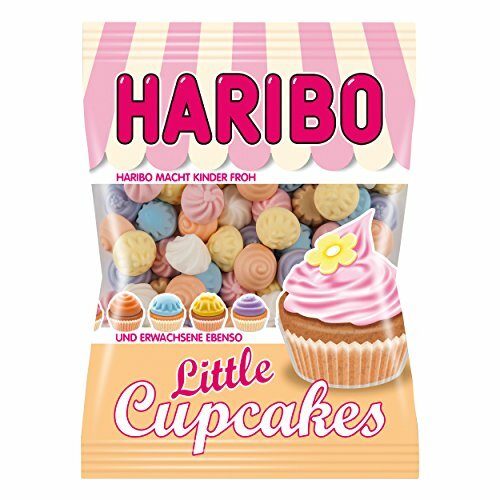 I find that little boys (and big ones) love these… I uses them as cupcake decorations for my son’s birthday. 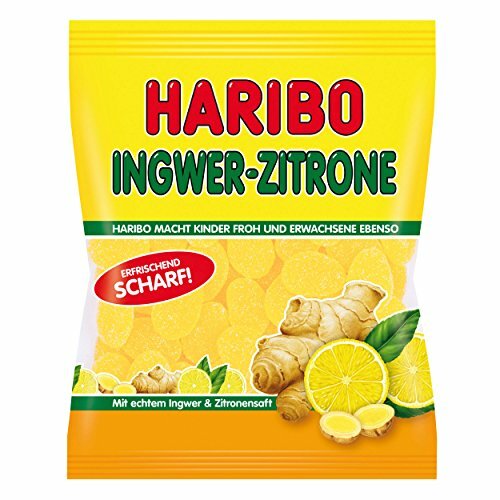 If you like strong flavors, then Haribo Ginger Lemon Gummies are for you. STRONG and INTENSE, and even a bit Spicy. 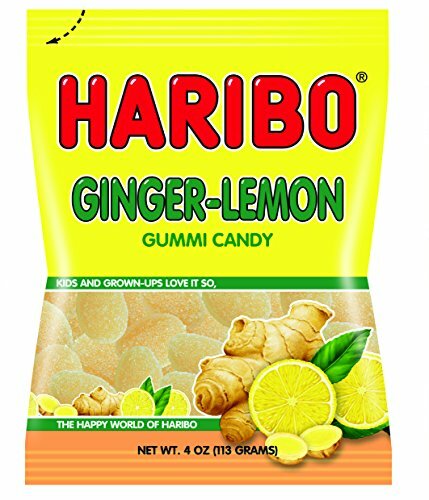 These are not for the faint of heart… But if you love Ginger, these are for you! German and American versions are available. 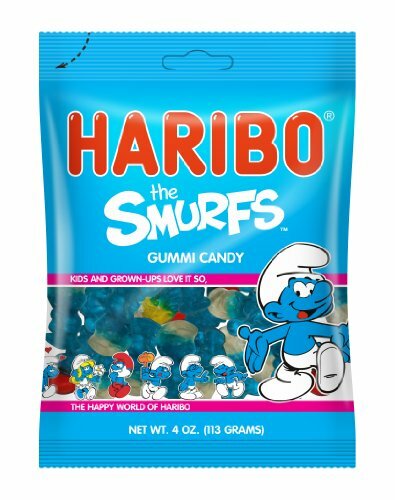 These Raspberry and Blueberry flavored gummis come in fun little Smurf shapes. 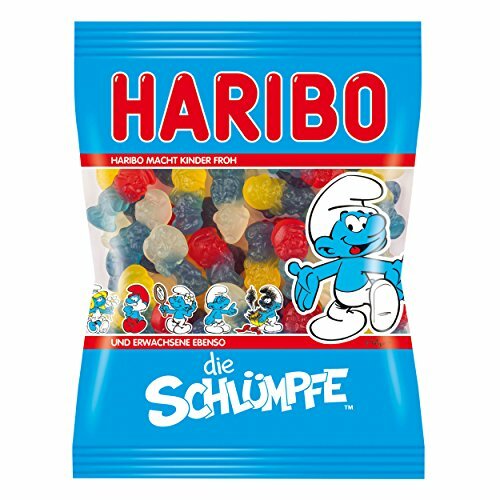 (Perfect for people who don’t care for apple or pineapple) The blue figures have red, yellow or white hats… I’m not sure why… don’t Smurfs all have white hats? Nevermind, they are awfully cute. 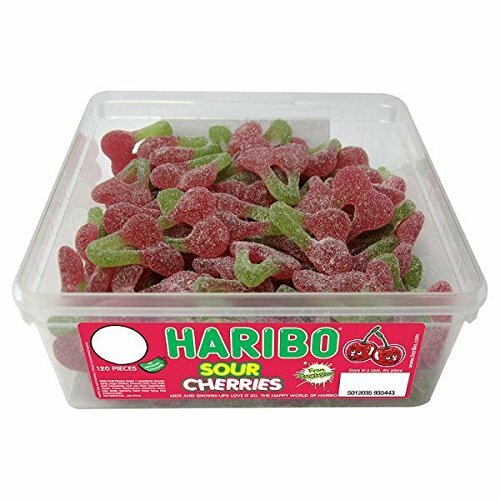 Haribo Sours are perfect if you love your candy with a bit of ZING! 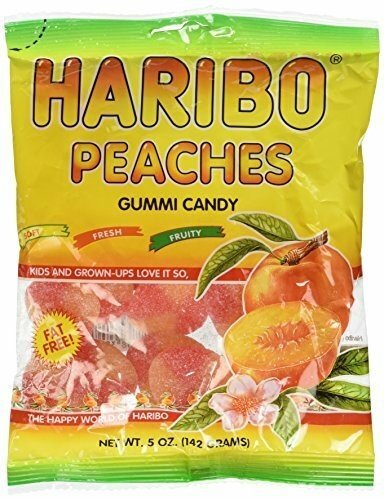 A lot of the same fruit flavors and shapes… but with a sugar coating that has a bite. 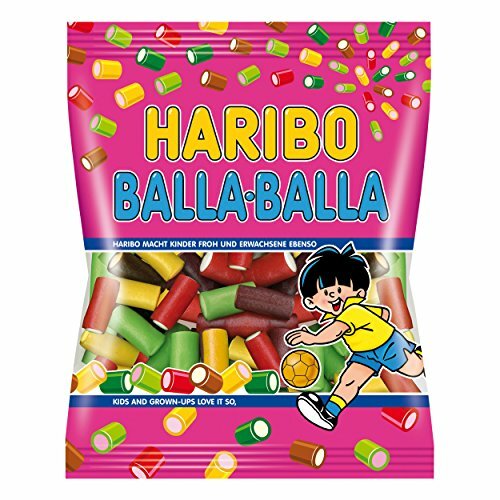 As a child, I loved that my dolly could have her own Haribo Pacifier… It’s nice that they are still around. 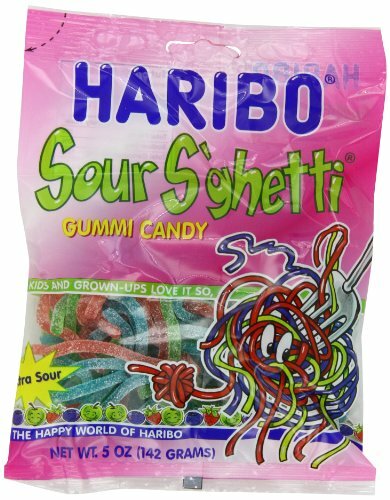 Don’t be fooled by the sugar coating, these candies are sour! 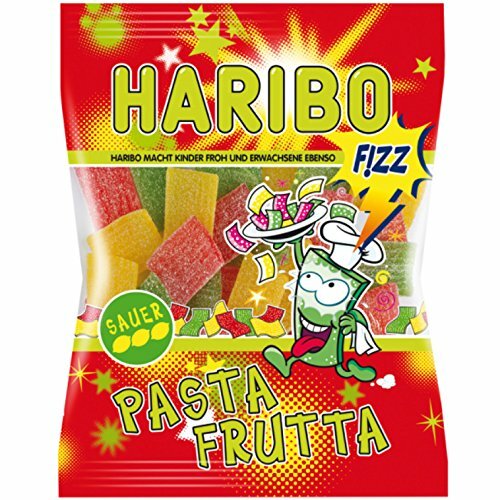 Haribo makes Sour Fruity Pasta shapes. Don’t put sauce on them. Do you ever wish you could sit in on a meeting where products like this are created…”Hey, I know! Sour Bear Tongues!” It just feels a bit random. 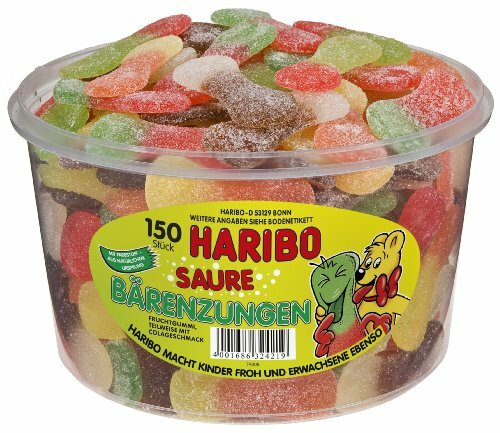 Still, if you love sour Haribo, you can buy a whole bucket of Tongues to keep yourself happy. 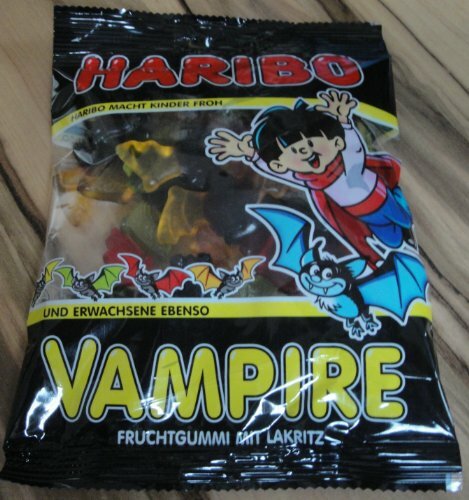 Halloween is only just beginning to take off in Germany, but that doesn’t stop Haribo from treating us to scary treats! 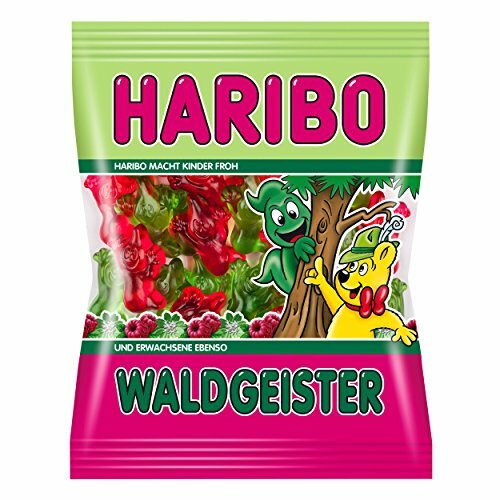 Waldmeister Ghosts and Haribo Vampires (with and without Licorice) are spooky fun! 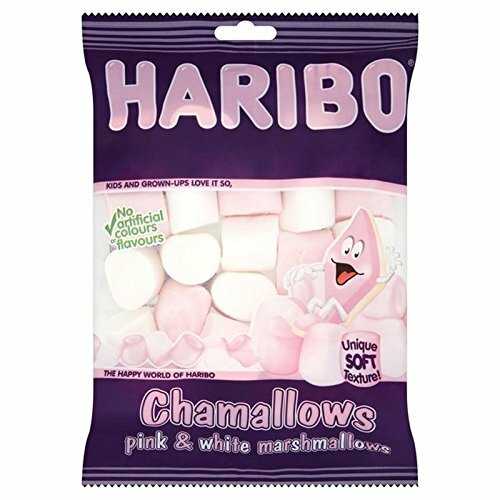 I love Haribo, I love Marshmallows… so I’m excited that I can get a combination. Some are fruity, some chocolate dipped there are even coconut covered chamallows! 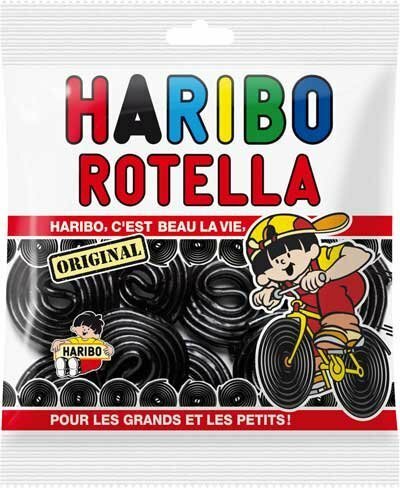 I admit, I’m not a fan of licorice, it’s just too strong. 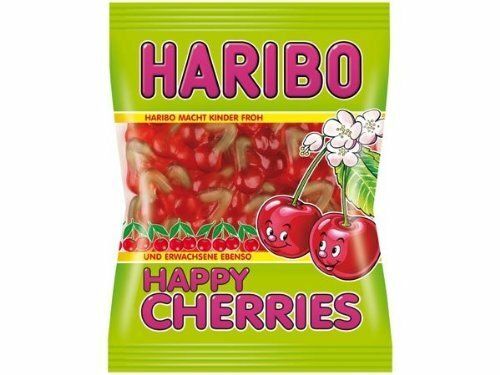 Still MANY people enjoy it, so, lucky for those people, Haribo makes a LOT of it. 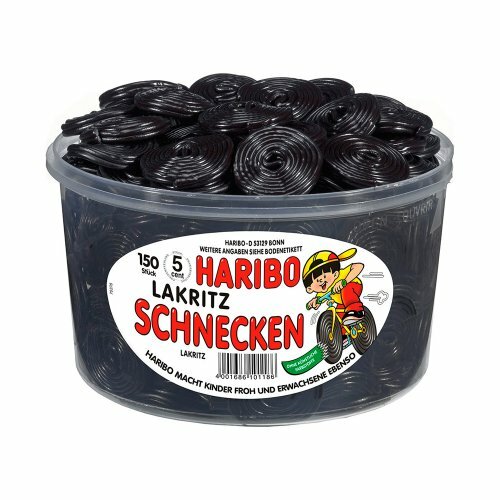 Go though most northern German or Dutch Markets, and you will find these colorful mixes of licorice bits. Fair warning, this is strong stuff… even though the colorful part mellows it out a bit. 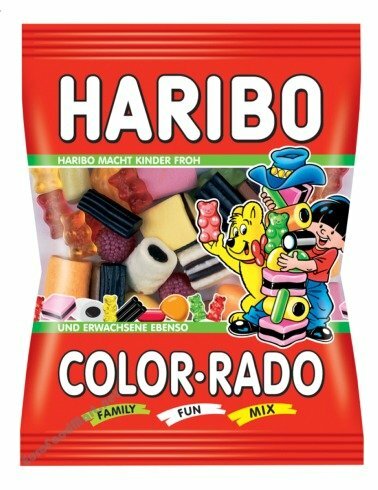 The Color-ado even mixes in other sorts of Haribo gummies. 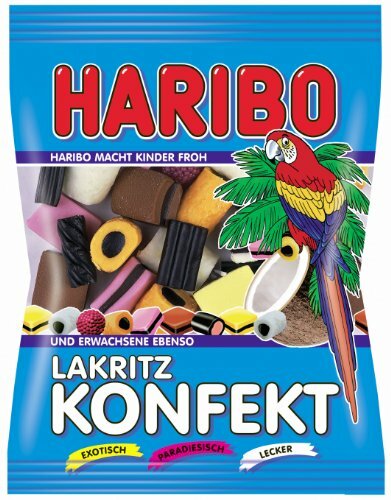 Haribo Lakritz Konfekt 200g/7.05oz Haribo Color-Rado Gummi Candy / 200g / 7.1oz. 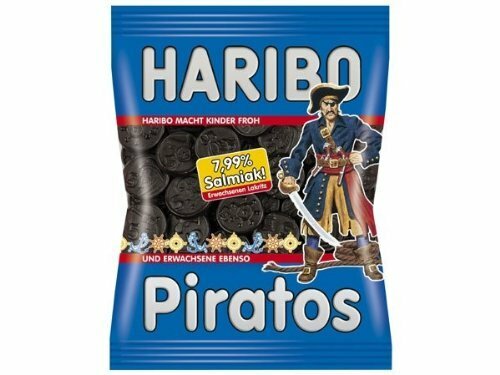 Haribo Black licorice comes in a variety of shapes… Long wound up ropes called snails, Pirate coins, bars and even cats. 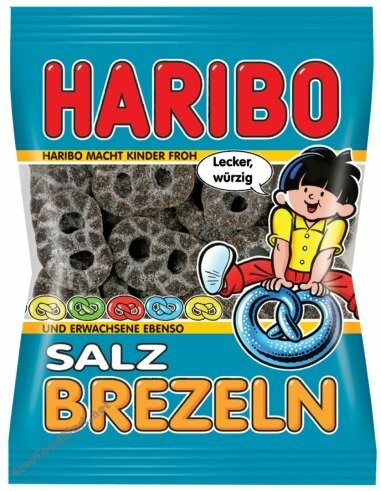 For people who like their candy a bit strong, bitter and salted… Haribo has the black licorice flavors for you! mmmmmm…. 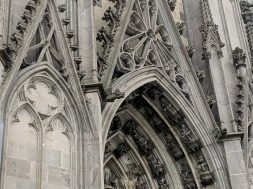 Herring…. Black Banana? Sounds like something I would use to make Banana Bread. But, it’s a candy. 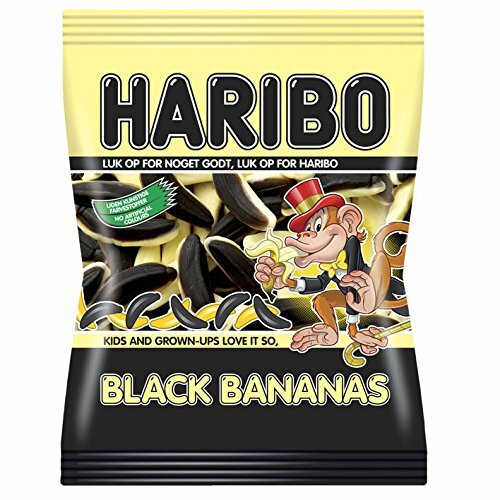 Licorice pieces, shaped like bananas, with a bit of banana flavoring. Someone please let me know how these taste, because I’m skeptical. 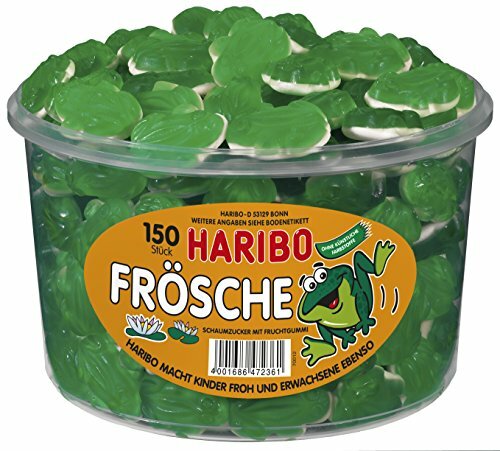 Want to buy a large amount of Haribo for your party? Having a gathering and want to make a Candy Bar? 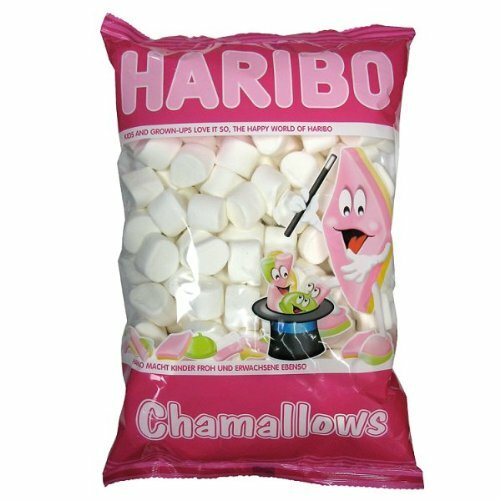 Check the Candy Store Website for great deals on bulk candy! 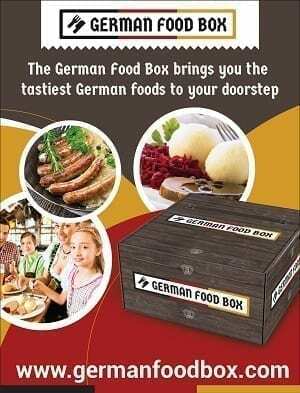 How to Schwenker Grill- Where to find a Schwenker Grill, How to Use it, and a delicious Schwenkbraten Recipe! 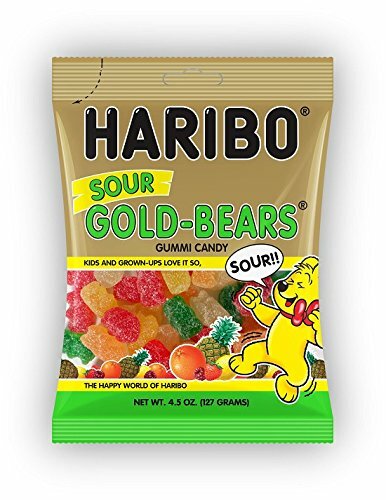 tags: American Gummi Bear Flavors are haribo gummi bears halal are haribo gummi bears kosher Buy Haribo Candy Online German Gummi Bear Flavors haribo candy online Haribo Gummi Bear Flavors Large Tubs Haribo Sweets What is the difference Between German and American Haribo Bears? What about strawberries and cream?